Chicago mayor-elect Lori Lightfoot cruised to victory in Tuesday's election, sweeping all 50 wards to become the first black female mayor, and first openly-LGBTQ mayor, in the city's history. Even before she finished first out of 14 total candidates in the Feb. 26 election, we asked her seven questions to help inform voters about who she is and where she stands on certain issues the city faces. What makes you uniquely qualified to be mayor of Chicago? 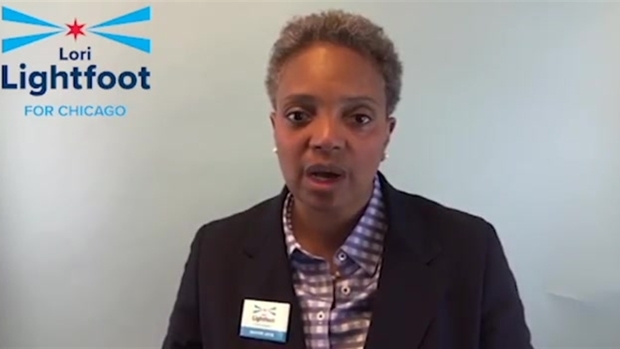 Lori Lightfoot shares why she believes she is uniquely qualified to be mayor of Chicago. Should you be elected mayor, what are your immediate priorities for your first year in office? I am running for mayor to to build a city government that listens to and prioritizes the needs of low-income and middle-class families. We’ve got to invest in people and neighborhoods. I believe there are many important issues facing Chicago, and I believe that all those problems are part of the same ecosystem that can breed some of the systemic problems that we see. For example, we must guarantee public safety as a basic right by addressing the root causes of violence, implementing a proactive strategy to stop gun violence, building trust between police officers and communities, and dramatically improving the low homicide clearance rate. We must spark economic development citywide by growing small businesses in neighborhoods, raising the minimum wage to $15 per hour, and building pathways to good jobs. We often see a reduction in crime when people have access to a vibrant local economy. We must ensure safe, clean, quality public schools in every neighborhood, and one way to help us get there is with an elected and representative school board. We must reduce taxes and fees that disproportionately harm low-income and middle-class families. And we must truly reform city government and put an end to corruption. How do you plan to continue implementing reforms to the Chicago Police Department as outlined in the consent decree? Over two years ago, I called for a consent decree to reform the Chicago Police Department and paved the way with the Police Accountability Task Force report. After closely following the years-long process—which included a lawsuit against the City by former Attorney General Lisa Madigan, hundreds of hours of negotiation between parties, and a lengthy process for public review and comment—I am pleased that Judge Robert Dow today announced the approval of the consent decree. The consent decree is an essential foundation for accountability and transparency. The success of the consent decree and the potential for further reform depend on the election of a mayor with the experience and vision to lead the way. I am the only candidate in this race that has a broad depth of experience in dealing with issues related to police excessive force and abuse, accountability and reform. My perspective on these issues stems from my roles as a federal prosecutor and the head of the former Office of Professional Standards, in which I made countless recommendations to terminate police officers who failed to properly perform their duties, including in police-involved shootings. More recently, I led the Police Accountability Task Force (PATF), whose report served as the underpinnings for both the Obama DOJ report and recommendations on the Chicago Police Department (CPD) and the consent decree. There would be no consent decree without the PATF. I also served as the president of Chicago Police Board, where I held officers accountable for misconduct. Before resigning from the police board to run for mayor, I significantly increased the number of officers that were terminated for serious misconduct or received lengthy suspensions. My body of work demonstrates my commitment to ensuring that public safety is available to everyone and in every neighborhood, that officers must be held accountable for misconduct and that taxpayers cannot continue to shoulder the burden of unchecked misconduct manifested in settlements, judgments, and attorneys' fees currently totaling over $500 million in the last seven years. Chicago Mayor Rahm Emanuel said he plans to meet with Mayor-elect Lori Lightfoot Wednesday afternoon to discuss a "seamless transition so she can hit the ground running on the first day." What is your plan to invest in education across the entire city of Chicago? As discussed in my education policy , I believe every child should be able to get a quality education at their neighborhood public school, no matter their race or zip code. I was a public school kid and remember how my school served as a community anchor and a source of pride for my neighborhood. As mayor, I will work with impacted communities to ensure there are safe, Level 1/1+ elementary and high school in every neighborhood, expand high school apprenticeship programs to create pathways to good jobs, create early childhood education zones and provide each school with basic educational support positions like librarians, nurses and social workers. We must conduct transparent and deep analysis of programs, schools and budgets, making a commitment to data and empirical analysis, and creating a culture of trying solutions and evaluating them to systematically improve outcomes. This will take time, but it is necessary. As mayor, I will follow the lead of other school districts around the country and help create policies and practices that undo the systems and structures that created and perpetuate inequities of opportunity and academic achievement. The first step is to create and adopt an equity policy statement that will act as a north star for CPS staff and students alike. In order to implement the policy, I will convene a district-wide equity council composed of educators who have had equity training and will be charged with ensuring the district complies with the equity policy moving forward. Lori Lightfoot shares her 90-year-old mother's message to her following the election results Tuesday. How do you plan to reduce property taxes? Our regressive property tax system is a serious problem for the City of Chicago and Cook County, and one that our next mayor must work diligently to solve. Many of the progressive revenue sources we need that do not unfairly burden working and middle class families will need approval from Springfield, or require years of work to implement. We must mount an effective lobbying campaign to ensure that we have the tools we need to fund necessary services without taxing working people out of the city. We must fix the broken and rigged property tax assessment system, and the next mayor and city officials must work with Cook County Assessor Fritz Kaegi to achieve this. As has been widely reported, Joe Berrios, who was endorsed and continues to be embraced by Toni Preckwinkle, oversaw an assessment system that failed to capture increases in the value of commercial and industrial properties. Homeowners, particularly those who are low and middle income, continue to be forced to pay higher property taxes as a result of Berrios’s rigged system. Rahm Emanuel was silent on this grievous wrong, and Toni Preckwinkle consistently excused Berrios and blamed others. I have consistently supported Kaegi’s reform efforts and will continue to press for change as mayor. City leaders cannot ask property owners to pay more until these inequities are fixed. What is your plan to address Chicago’s unfunded pension liability? First, we must start from the firm position that pensions are a promise--and that protecting the retirement security of our public employees is imperative to maintaining a stable middle class and, thereby, our local economy. Chicago needs additional revenue to address the pension crisis, but revenues are only part of the solution. In order to build the public case for additional revenue, the city must demonstrate to taxpayers that it takes seriously its obligation as a responsible fiscal steward of the public’s hard-earned tax dollars. This must start with making city government run as efficiently as possible. Going forward from there, we must look to progressive revenue sources thought advocacy and lobbying in Springfield. The next mayor must look into structural reforms that can result in meaningful cost-savings without breaking our contractual obligations to workers. This includes placing the city’s $100 million per-year workers’ compensation program in the executive branch, reforming and closely monitoring the Chicago Police Department’s overtime policies and procedures, and employing a professional risk manager to reduce the city’s annual payments for judgements, settlements and legal fees. Achieving even modest savings of 10% to 15% in each of these areas would save between $35 million and $52 million annually. Additionally, the next mayor should combine the administrative and investment functions of the city’s four pension plans, which in 2017 collectively spent over $60 million on administrative costs and investment fees, to create economies of scale and significantly reduce costs so more money stays in the pension funds. Finally, we will have no choice, if we want to act in a fiscally responsible way, but to explore alternatives to a city-funded pension for people hired on or after January 1, 2020. Just as pensions are a promise, we cannot make promises that we have no ability to keep. How do you plan to curb violence in Chicago? While we need to maintain a strong police force, numbers alone are not the answer. My public safety plan includes multiple strategies for making public safety a reality regardless of zip code. It starts with treating the epidemic of violence as the public health crisis that it is. I outline many ways in which we need to focus on the root causes of violence. We also need to have a proactive plan, with our federal partners, to stop guns from coming into the city. We must also improve our woeful homicide clearance rate, like having beat officers build relationships in the communities they serve, improving on-scene evidence collection, getting detectives into communities, providing support for victims and their families, and witnesses, buying a mobile ballistics lab, and strategically deploying police cameras.